It's $4.99 per month, but won't have ESPN's cable TV content. ESPN+ will also carry a daily soccer talk show and original series commissioned just for the service, including a weekly show, "Quest for the Stanley Cup," a documentary following players during the NHL playoffs. Despite the subscription, the new service will not be free of ads. 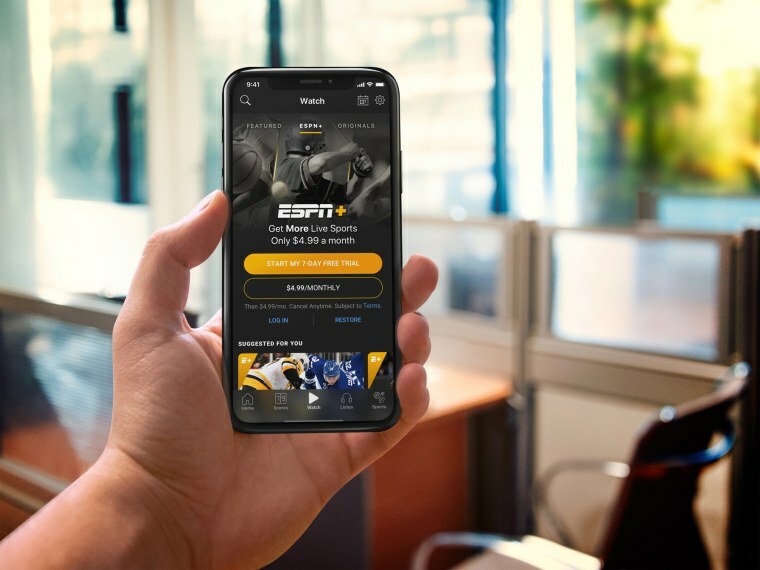 With ESPN+, Disney is trying to carve out a niche in the growing direct-to-consumer online video business while simultaneously protecting its flagship channel from subscriber declines. It is a high-stakes tightrope walk for the new president of ESPN, James Pitaro, who took over last month. “What you see on [cable TV] will not make its way on the subscription service. And what’s on the subscription service will not be on television,” Pitaro added. Terry Kawaja, CEO of Luma Partners, a mergers and acquisitions advisory firm, said ESPN has to be careful not to hurt its still-lucrative cable business while also not falling too far behind the consumer shift to internet-based entertainment. "No one wants to kill the golden goose," he said at a TV conference on Thursday in New York hosted media buying agency The Media Kitchen. Many of the major sports leagues that sell broadcast rights to ESPN are already offering ways to watch games on the internet, such as MLB.TV and NBA League Pass. ESPN remains one of the biggest media success stories in cable television. The company grew from a small, Connecticut-based channel showing highlights and obscure sporting events into a national powerhouse capable of bidding billions of dollars on major professional sports packages. Crucial to its success were the outsize payments ESPN commanded from cable providers — as much as $8 per subscriber per month, according to media analysis firm SNL Kagan. But as ESPN’s total subscribers peaked and then began to decline, the company’s future became the subject of scrutiny from Wall Street analysts who predicted that its best days were in the past. The new ESPN+ service is available only in the U.S. for now, though in an interview with Variety, Pitaro said, "Our primary focus is on making ESPN more relevant to more people across the world." Disney also owns BAMTech, a streaming service company started by MLB that Disney later acquired. BAMTech is helping power Disney’s streaming services, and also has a joint venture with Discovery Communications — BAMTech Europe — that could help take ESPN+ to Europe, where the ESPN brand has little presence. In addition to being a big step for ESPN, the new streaming service is also the first paid streaming venture in the U.S. for Disney, which is aiming to take on Netflix and Amazon in streaming video entertainment. Disney has announced plans for a separate entertainment service with movies and TV shows that is scheduled to launch in 2019 with some content that was previously on Netflix.